We are all aware of the fact that occultism means something beyond general conscience’s reach but even so, we hear this word more and more nowadays. That is why occultism is not a hidden phenomena anymore. Anyways, concerning the unseen world, we had a talk with Mors Dalos Ra of Necros Christos in order to understand better what is all about with his music and the strangeness we feel there. Mors Dalos Ra took exquisite care of his unseen world and so he talked about it by introducing here and there rabbinic terms or strong names related to the mystic doctrines of Kabbalah. Besides his views on infinity and other abstract concepts, we have also some words about Necros Christos plans, influences and meaning. How’s it going? What’s the current focus of Necros Christos after releasing the Nine Graves EP? Mors Dalos Ra: We currently do travel on many roads so to say. Of course, the promotion for Nine Graves demanded to give lots of interviews, but it all calms down a bit right now and we just focus on rehearsing as well as writing new songs. We shall play at least one last show this year in Dublin in November, alongside PRIMORDIAL`s record release event. Looking more than forward to this one tough! What is the source of the occult approach in your music? We all know that the occult thing is something unspeakable or so it should be, but now we are talking about individual ways of getting inspiration. In what way does occultism interfere with your life? Mors Dalos Ra: Since my earliest childhood, I felt strangely addicted and drawn to this unspeakable realm. The very first thing I actually do remember is my baptism, on which I was one and a half year old. I still can see the scenery as being burned in my mind, people standing in the cold November rain outside that very old church, everything seemed to be really blurred and dark. I remember the smell of the stones, the water and something utmost spiritual, some Thing, which was there. I visited that church more than 36 years later and some signs, which I got aware of during that visitation, came close to a personal revelation. Note that this has nothing to do with Christianity in general, I try to describe what I felt. When being one and a half year old, you haven`t heard about God or Jesus, but your senses are already glowing in full effect, you simply feel. The second coming occurred when I was approximately three years old, spending vacations with my parents on Crete, Greece. I had a seriously bad infection of my tonsils, but when it got discovered, fever and disease had already laid their foul hands upon me. I was brought to a hospital, but no bed was left, so they put me in a small stinking cell reeking of excrements and disease. And guess what, it was the room for the dead. During this night, I left my body for the first time, seeing this painful vessel of mine beneath. Later on, my father, who was kind of a devoted hobby archaeologist, took me to places all around Greece, Turkey and so on. I guess that should explain my addiction to the oriental world as well as being consumed by all occult spirituality. Take all of that memories and experiences combined with my own style of writing (Death) Metal songs and you have the essence of what NECROS CHRISTOS is all about. What is your own philosophy about death, blackness, or void? People often perceive these phenomena as an end. What does the end mean for you? Mors Dalos Ra: It is no end and our souls have none. Since an adoil of tyme, we`re forced to re-incarnate again and again, until the primordial ocean of souls shall re-unite in Adam Kadmon. But since we lost contact with the primary influx of Ain Soph eternal, hidden within Domedon Doxomedon realm, this final return to the essence won`t never happen and our souls are cursed to be thrown into worlds and netherworlds forever. Within the Nine Graves EP, it is more obvious than ever that one of your main inspirations has to do with the Oriental spirituality and musical expression, with the religious culture of the Eastern side, actually the realms of the living sun. Even though, we all could notice the fact that your interest in this part of the world was emphasized on the previous Necros Christos materials also. The most profound philosophies regarding humankind, micro and macrocosmos were developed there in the ancient past. Nowadays, many of these regions seem to be buried in social and territorial conflicts, overpopulation, both spiritual and material poverty and so on. What is your view about this extreme turning point? Mors Dalos Ra: I try to follow the news every day and it makes me becoming sick, really. What kind of disgusting things happen when delusion, disorder and fanaticism take over and possess the mind and heart of people, everybody can see at many different corners of the world right at the moment. No matter of what kind of religion, if anybody really proclaims to inherit the one and only belief, if he discriminates others due to their religion or he/she even kills due to that, he/she simply does NOT believe. They all do serve just “the other side” they actually want to avoid, but our world has become damn sick and it shall be cleansed very soon by the will and powers of the radiant light of Ain Soph absolute. How do you feel before playing in front people? Do you take into account that there are lots of energies that you have to deal with and make a specific preparation? Or does everything come just naturally? Mors Dalos Ra: I love what I do, so there`s no complain at all. I have no problem by performing in front of others and mostly, we`re blessed with such an excellent crowd, that it is a sheer pleasure to play. Indeed, if the audience is really into our sound, we`re able to absorb all the energies and transform them into our own performance. This might be the highest state of ecstasy one can think off, but we luckily had many rites where things like this happened. When it comes to demonology, people tend to associate the evilness with it because of Christianity. But before Christianity became an official religion, mythological demons were seen as both good and evil. Also, most demons were actually messengers between individuals and entities. What is the role of Necros Christos in terms of your own visions? Mors Dalos Ra: NECROS CHRISTOS is the messenger. When I was approximately seven years old, a demon named Dalos revealed his spirit unto me and when I was way older, the foul vessel of the nine dolours of Christ, also known as NECROS CHRISTOS, transmitted his prophecy. When did you discover your interest in Kabbalah? How did you see this tradition in the beginning and how did your views evolve regarding this form of mysticism? Mors Dalos Ra: I can`t remember properly when exactly my interest in Jewish mysticism rose to a high degree, but when I stumbled across the first fragments of texts years ago, I immediately felt a strong connection to that source, something, which I never felt before. I just read and studied the Sefer ha-Sohar this summer for the (maybe) third time, I read the Sefer ha-Bahir and of course, Gershom Scholem`s works are always present. How do you see the metal world of today and to whom do you dedicate your music? Mors Dalos Ra: To everyone who is open minded and to all our brethren and sisters of the NC Temple. Further to such amazing artists as Manuel Tinnemans, Timo Ketola, the covens of SVR RECORDS and VÀN RECORDS, GRAVE MIASMA, VENENUM, GRIFTEGǺRD, TEITANBLOOD, ASCENSION, SOTM, PENTACLE, DROWNED, ESSENZ, NEGATIVE PLANE, THE RUINS OF BEVERAST, THE WOUNDED KINGS, YEAR OF THE GOAT, ARKTAU EOS, DEAD CONGREGATION, just to name a few. It was eight years ago when you released a split with Teitanblood. What is the relation between you and the two guys of Teitanblood today and how do you see their esoteric approach on music comparing to yours? Mors Dalos Ra: The esoteric approach might be too personal too speak about, but their approach to Death Metal is someway different. NsK belongs to my closest friends and I feel nothing but the highest respect for TTB. 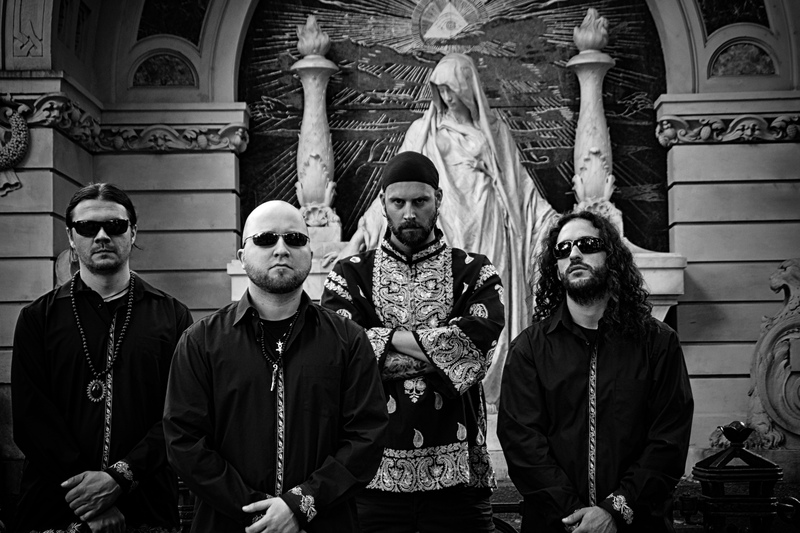 One of the, if not THE most extreme band in the world of (Death) Metal nowadays. Those guys are real magicians for sure. 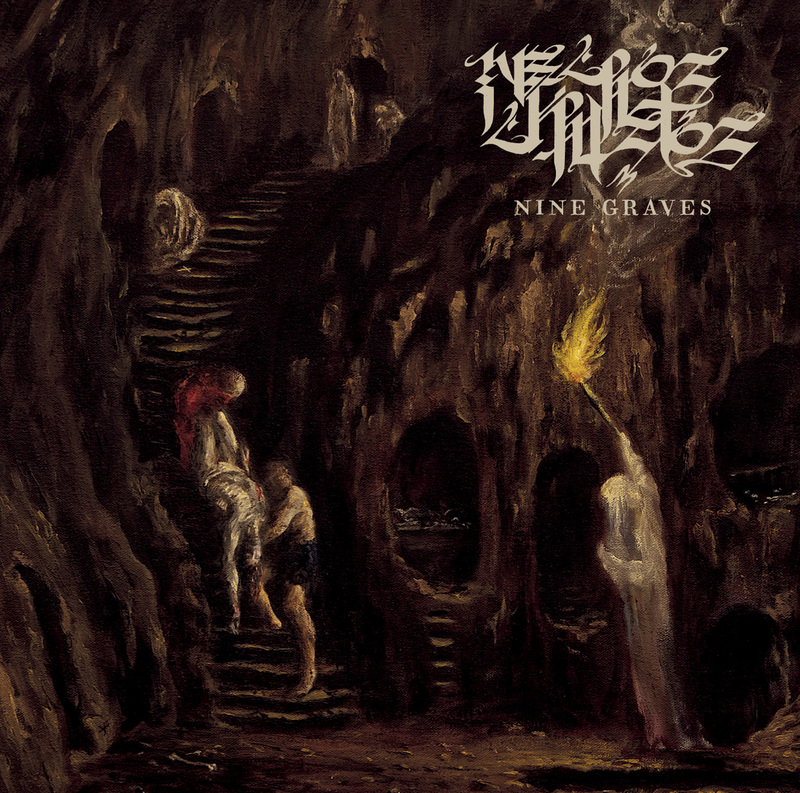 How did you decide to work with Timo Ketola for the Nine Grave artwork cover? What do you like most when it comes to his art? Mors Dalos Ra: Timo is an old friend of NC and has done many signs and wonders for our Temple. And honestly, he`s one of the most serious occultists I can think of, his knowledge is of unbelievable dimensions. There was this painting of Eugene Delacroix I came across, “Christ carried down to the tomb”, which I had in mind when speaking first about the cover concept with Master Ketola. The final painting he delivered just made me speechless, you nearly can smell the cold, foul air of that mass rock-cut tomb somewhere in the Middle East. We also know that you are into traditional music from Indian and Persian cultures. Can you recommend us something like that by naming a few of your favorite artists? Mors Dalos Ra: With utmost pleasure. Out of India, I would like to name first the greatest Sitarist of all time, namely Nikhil Banerjee. Other important names would be Ajoy Chakrabarty, Ali Akbar Khan, Sultan Khan, Kala Ramnath, Tejendra Narayan Majumdar, Prabha Atre, Purbayan Chatterjee and Irshad Khan. Going to Persia, blessed be the works of Hesameddin Seraj, Ramin Kakavand, Davood Azad and Salar Aghili. Who is your favorite modern or contemporary writer when it comes to religious studies? Mors Dalos Ra: Gershom Scholem, no second thought needed! His writings and essays about Kabbala mysticism opened my eyes and I saw clear. In the end, we would like to thank you very much for sharing us a part of your visions and feel free to write anything you want for those who appreciate and relate to your work. 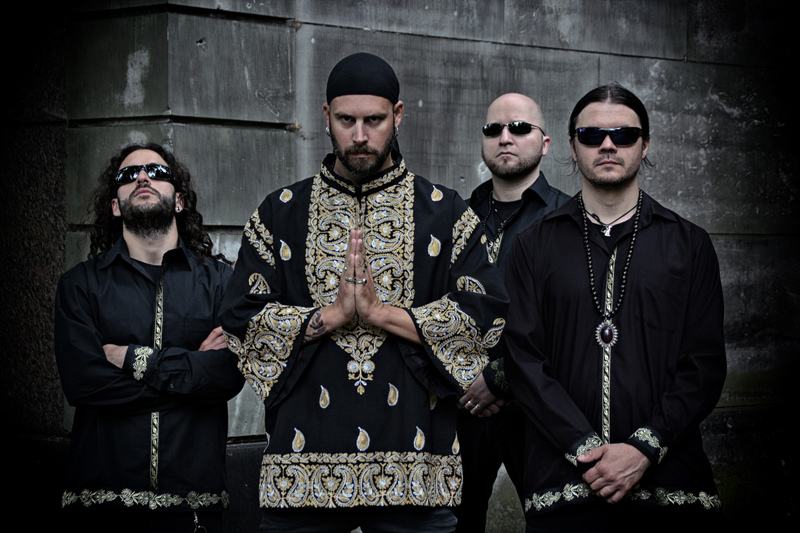 Mors Dalos Ra: Thanks a lot for the interview, it was a pleasure to answer! Whoever thinks in terms of country borders or skin colour has no place within the realm of NC. Death Metal has no boundaries. And so doth NECROS CHRISTOS.